Experience the beautiful archipelago and Southern Norway idyll. Our central and cosy hotel is a perfect base for exploring charming Grimstad. Savour delicious food and drink in our restaurants. Enjoy quiet days with the family or book your next meeting with us. We have everything you need for a pleasant stay. Get a good night’s sleep in one of our comfortable rooms, enjoy a delicious breakfast, borrow a bike and take a bike ride. When you get back, enjoy a lovely dinner in our popular restaurant Kjeller’n. Our hotel offers several meeting rooms of different sizes, in addition to its own parking garage and free WiFi in all public areas and hotel rooms. Our cosy and charming hotel is located in the centre of Grimstad’s old town. The archipelago right off the coast is regarded as one of the most beautiful in Norway. With a central location near restaurants, shops, museums and the town’s lively cultural life, our hotel is an ideal base to explore this idyllic destination. The hotel is located just 30 minutes from Kjevik airport and 20 minutes from Arendal train station. 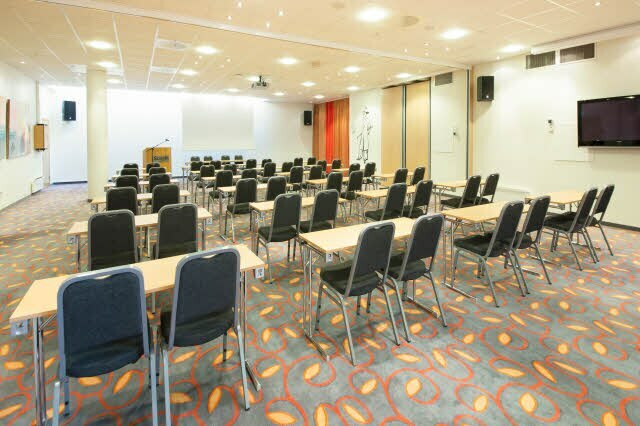 Scandic Grimstad with its maritime style is located amongst charming white wooden houses, and offers you conference rooms for up to 120 participants.